We are a locally owned smoothie business in Albuquerque, NM providing a convenient way to nourish your body – GROWLER sized! We all have choices when it comes to our food, and ultimately our health. We believe that if we take care of our bodies; our bodies will take care of us. An essential part of taking care of our body is consuming “real” food – so we can thrive (not just survive). The fresh, organic, raw ingredients used in our smoothies provide disease fighting antioxidants, gut friendly fiber, inflammation fighting polyphenols, and a host of nourishing vitamins and minerals. Do we really believe “chewing is for suckers”? Absolutely! Let’s face it; in some instances it’s way easier to drink an amazing salad than make one. It is challenging to feed your body well when you are in a hurry or not feeling up to cooking… The answer? Green Growler Smoothies! Are you just surviving or are you thriving? What choice will you make today that will truly impact your body for good? 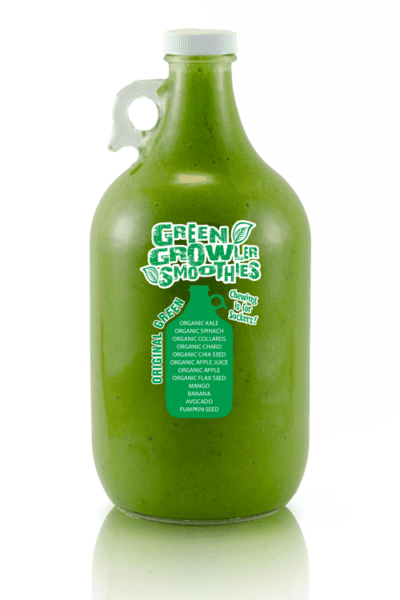 Try Green Growler Smoothies today!